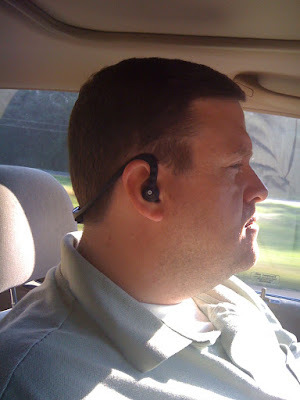 I've never been a big fan of bluetooth earpieces. You know, the little pieces of plastic that people put in their ears so that they can walk around Wal-mart talking on their phone without spending the energy it would take to hold the phone in their hand. Usually when I see those people, I first hear them talking to themselves and I become concerned that they might need a visit from "those nice young men in their clean white coats" ((They're coming to take me away! Ha! Ha! ))But then I see their earpiece and I realize that they are on the phone. Second, once I see the device in their ear, I'm reminded of "The Borg" on Star Trek. Once we start adding electronic devices that light up on our faces, we're only a few technological steps away from becoming part robot. I started this by saying I'm not a big fan. I think before I go any further, I should probably admit that I do own one of those little annoying gadgets. But I've only used it a handful of times. But only in the car, and only when I was by myself. Plus I got it real cheap. Ok, that having been said, I'd like to tell you about my new toy. For Father's Day this year I got some nice cards from my wife and kids and a little cash to play with. I had heard from Chris that with the new iPhone software update that I could now use wireless headphones to listen to it in stereo. I decided to look into that a little more. I wanted to find something that could be used both for the ipod and the phone and that would be rugged enough that I would not have to worry if I dropped it while on the treadmill or chasing kids around the house. So that led me to the Motorola S9-HD headphones. They don't exactly make me look cool, but I figure they don't make me look like a Borg either. And they're definitely better than driving down the road with wired ipod earbuds in my ears. 1.) Give me a call. so I can say hello to you from my new toy. 2.) Get far away quickly before you get caught in the gravity of that massive face. Wow that's a big face. I've never been diagnosed as having A.D.D., but I wouldn't be surprised to find out that I have it. I'm very easily distracted, especially from things I don't enjoy. If I'm watching a movie, it would take a catastrophe happening around me to get my attention away from the screen. On the other hand, when I'm at work or at home doing something chore-ish (laundry, washing dishes, etc.) the smallest distraction can lead me astray. I’m distracted easily when I’m at a computer. At work, I get calls all day long and I recently found myself talking with a Welding Distributor from California who’s name was Gordon. Now Gordon is not a very common name, so it brought to my mind the only two Gordon’s that I’ve encountered in my life. One, I went to high school with. The other Gordon that came to mind was Gordon Shumway. Now you may be asking yourself who is Gordon Shumway? That’s Alf’s name. You remember Alf don’t you? The 1980’s sitcom about the Alien Life Form that lived with a suburban family and ate cats. He was a puppet. Before coming to earth and being called Alf, his name was Gordon Shumway on his home planet. (Sadly, this is the kind of information that takes up space in my brain, not tons of scripture, not 2 years of high school Spanish, but details about ALF.) Anyway, so I get off the phone with Gordon, and I’m thinking about ALF, and I remember that I saw every episode of that show but never saw how it ended. So of course, rather than taking time to file something or do anything work related, I decide to take a few minutes and google info about ALF to learn how it ended. Before long, I had spent approx 10 minutes AT WORK surfing the web learning about ALF. Once I had learned about ALF's sad demise (it never really ended, just got cancelled after a cliffhanger season finale) I realized I owed my boss about 10 minutes of work time. I knew something needed to be done to help me stay on task. It will create a note that will pop up every 20 minutes asking you "Are you being productive?" If you answer yes, it will go away and pop back up 20 minutes later to ask you the same thing. If you answer no, it will go away and stop bothering you until you click on that file to start it running again. Believe it or not, this has actually helped me be more productive at work. I'll leave you with some examples. 1.) Do you look Marvelous? 3.) Have you paid Shawn the money you owe him? 4.) Did you remember to use deodorant? 5.) Have you googled ALF today? I am not an iPhone expert. But I've had one since Christmas. Yes, I talk about her (Iris the iPhone) frequently. So people have been asking me recently what apps I like. For those of you who have your own personal Iris or are considering getting one. This blog entry is for you. My Top 10 List of frequently used and enjoyed iPhone Apps. 1.) Say Where? - My friend Chris introduced this one to me. With the simple click of your screen you can tell you phone where you want to go (address or business name) and it gives you detailed directions via the GPS. 2.) Facebook - Gotta have access to facebook while on the road. One advantage is that this mobile version won't bog you down with goofy quizzes or farm town requests. You can choose to only see folk's status updates (a feature I miss on the facebook website. 4.) The Weather Channel - The iPhone has its own weather app, but this one from the weather channel will give you satellite images. Nice feature to have when you're at the ballpark wondering when the rain's gonna pass. 6.) Flixster - Quick access to Movie reviews, trailers, and local showtimes. 7.) Bible - Youversion - Numerous searchable translations of the bible. 8.) Pandora - portable music of any style. Simply type in an artist or song name and it creates a channel just for you. 9.) Evernote - I'm still learning this one, but so far I like it. A great reminder tool. You can write a note, take a pic, or record a voice note. 10.) Shozu - Another new one I'm still figuring out but love so far. Quick upload of pics or text to your favorite websites. Example. I can take a pic and upload it once and it will post to my blog, my facebook and flickr. Definitely a time saver. Honorable mentions... Ebay, Google reader, & Phone flix. And I didn't even include any games. It's been a while since I blogged on a regular basis. I'd like to share with you why. I think this is a pretty good description of who I am. The only traits I'm not sure about here are "Secretive, May Feel Life Is Unfair, Strong Negotaitor" Those three I don't really see in myself. Especially the strong negotiator. As a person who hates conflict, I typically try to avoid situations which require strong negotiation. But the peacemaker in me will try to smooth over a situation. So I guess it's not too far off the mark. I think one trait that is typical of a middle child that describes me is being a "people pleaser." I want everyone to be happy. I agree with Mr. King when he asked "Why can't we all just get along?" (Rodney King not Dr. Martin Luther The King) So I wonder, why in the world would a people pleaser choose to be a worship leader? Every Sunday I place myself in a position of being judged. There are hundreds of people in the sanctuary judging every song. Unfortunately, in a service that is blended traditional hymns and modern worship, every song you sing is possibly not liked by someone in the room. And somehow I'm OK with that. I realize that everyone worships differently and if you don't like the song we're singing now, hang on you might like the next one. But I realized recently, that in my personal life, I don't let go of judgements quite so easily. You may have noticed that I haven't been blogging as much recently. A couple of months ago, some of my blogging friends sat around discussing our blogs and the subject came up about being a good writer. Now I will be the first to acknowledge that I am not a great writer. But in that conversation they all agreed (strongly) with my opinion of my own writing skills. Some actually had advice on how I could be a better writer. If I'm being totally honest, it cut pretty deep. So deep that I decided that maybe I should not blog as much and only try to post articles that were clearly thought out, well written, and possibly good. While I have not stuck to those standards in my recent blogs, I have found myself starting a blog article every day, only to decide it wasn't good enough and never posting those entries. Well, today is a new day. I have accepted that fact that my blog is not going to be funny or snarky. It's not going to be informative or educational, It's definitely not going to be inspiring. It's just going to be what it started out as being, Tales from Street Road. You may come here to see stories from my life as a father, husband, inside sales guy, & worship leader. If you enjoy good writing, correct grammar, short sentences, and witty writing, there are thousands of other blogs out on the interwebs for you to enjoy. On the other hand, if you like difficult to follow "run-on" sentences, excessive use of "quotes" and commas, and general random thoughts from a Christian, college educated, married nerd/redneck father, then this is the place for you. To close, I'll leave you with this nugget of grammar wisdom from the guys at 30 Rock: "You should never end a sentence with a preposition at." I complain somethines about being so busy. But truthfully, I love my life. I'm blessed to have two jobs that I enjoy and a wonderful family and church. One of the great things about my full time job is the benefit package that is available. Last week I learned that I was eligible to enroll in an Aflac disability insurance plan. It's insurance that will pay my bills if I'm in an accident that causes me to loose my job or have to take a long time off. At first, I felt pretty good about this benefit and the company providing it. Then the insurance agent gave me the Aflac duck pictured. Take a close look at the eyes. Notice anything unusual? I'm pretty sure my duck is "special". 2 questions: 1.What type of accident do you think made this ugly duckling disabled? 2. What should I name him? Something old = my meaty hand. Something new = the wedding band. Sadly I lost my original ring way back in September. The last time I remember wearing it I was talking to Kristi about how loose it was since my weight loss. I haven't seen it since. I been trying to convince myself that I would find it somewhere in my cluttered home office or car, but no such luck. So this past Saturday I took my whole family and picked out a new ring. Sadly, the price of gold is way up due to the economy, so my new ring cost me more than twice what I paid for my original one. While that's bad, I'm really more sad that I lost my original one. I assume now that I've bought a new one, I'll find my original one before the end of the week.